I have 10+ yr old walnut counter tops and would never recommend them. When new - beautiful, but hard to keep clean without ruining them. If you don't cook much, perhaps they'll hold up better. 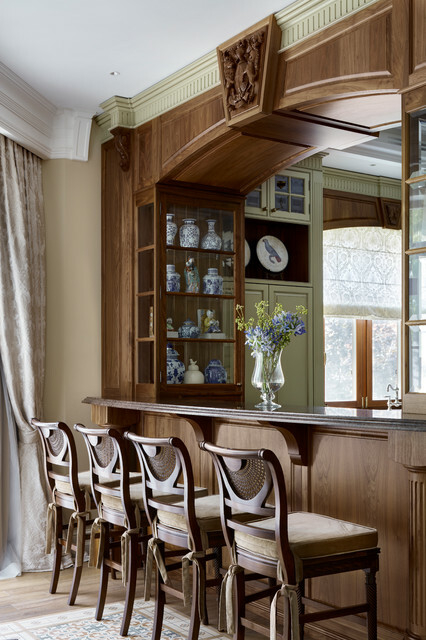 For a family kitchen, durability is key. 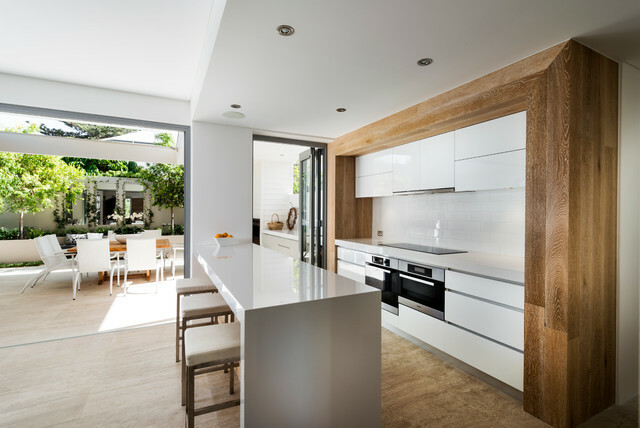 - I love the ceiling in this kitchen and would like details as to what materials have been used? Could I have the mfg and color of the beautiful hardwood floors! Do you have the color and mfg of the cabinets? - Hi. 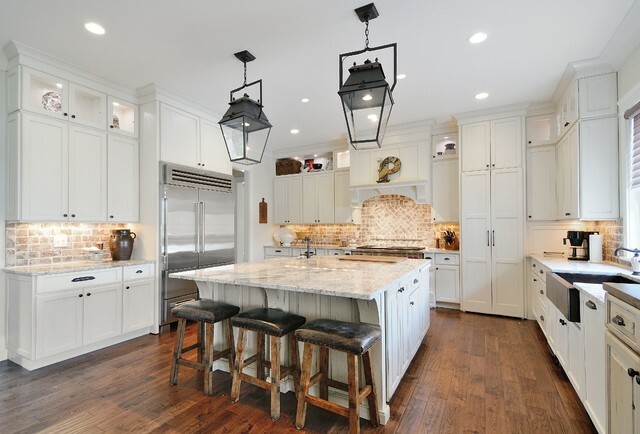 I haven't seen pendant lights like this before for a kitchen. Good scale. Could you post who makes them? Thanks. Hi, what is the finish of the drawer pulls? Where are the lights from above the bar? Where can one find an island like this one? It's exactly what we are looking for! - Would looove to know more about how to purchase an island like this! thanks! Like the layout of kitchen; similar room so, potential for remodeling same way. 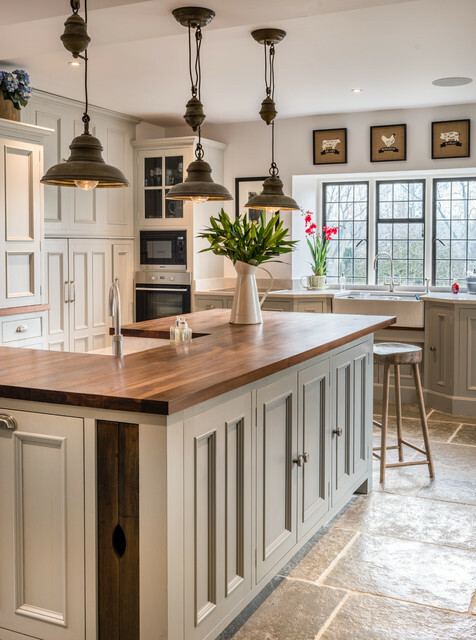 Would love to see more pictures of this kitchen at different angles. anybody knows what type of wood is the counter top and the cabinets?? Is that one piece of wood or tongue and groove pieces? above he said the island top is walnut. Can you provide details of this gorgeous flooring? Where are the stools from? Thanks! They are on our website www.mrbarstool.com $49.99 They are currently featured on our home page as a "best seller"
Does this product just soak into the wood and not give it a think finish like Epoxy? what kind of paneling is used on the ceiling and island? We are a 100% true factory specially manufacturing kitchen cabinets and solid wood home furniture. Located in Yanghang industrial park Baoshan, Shanghai, China. Cannot wait to see what you do! I miss seeing updates around your own house. Love your style so much,hoping to get great ideas from you. WHERE IS THE STOVE TOP FROM ? Can you tell me the dimensions of the center island please? can you tell me the dimensions of the island? Is it actual tongue and groove planks on the ceiling? Were are they available? I really like the lights where are they from? If you like that style pendant, we have very similar style on our website ! What kind of wood is used as the counter top? I'd like to know what kind of wood is it as well. Ikea sells wood counter tops in birch beech and oak. Just bought beech piece for the center island in our beach house. - Many questions about the lighting. I too would like to know where to purchase them from. No answer yet. 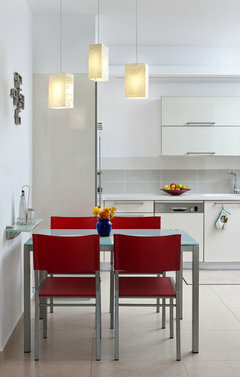 These pendant lights look like Artemide Jupe 8-11 suspension lights. - Can you give me information on the floors? It looks like a very pretty pre finished and hand scraped floor, Oak or Hickory. - Could you tell me where to purchase the bar stools? Thank you, kiff18, for taking the time to respond. I will check it out! i have similar if not exact same one's. i got them at Bed Bath Beyond. Brand and model of the pendants? Click on the tag to find out details. What kind of floor is this? how to move photo in idea book to another category? 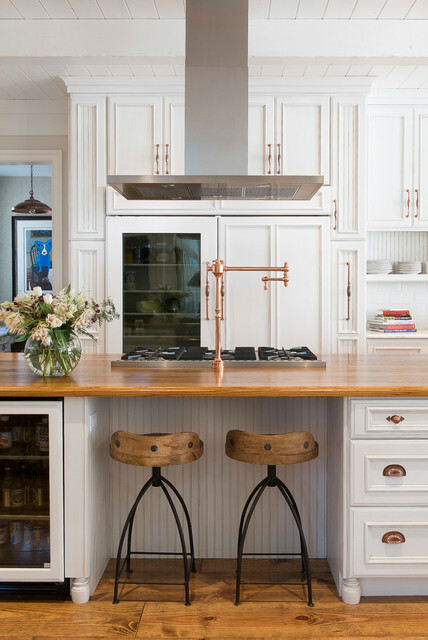 Is the island countertop butcher block or what??? 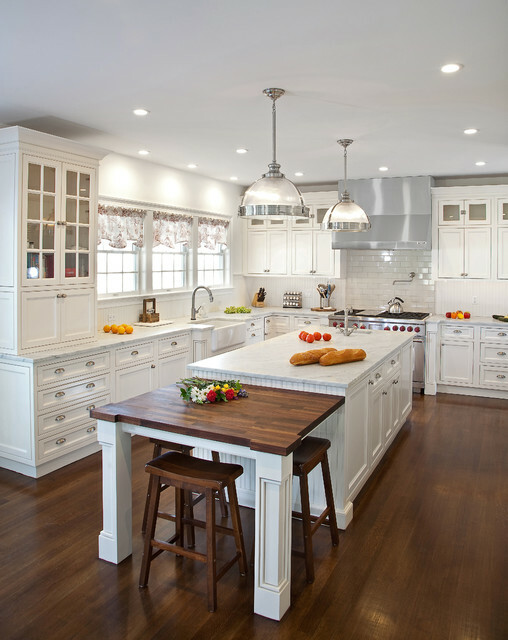 This island is side grain butcher block as opposed to end grain which is the checker board style. 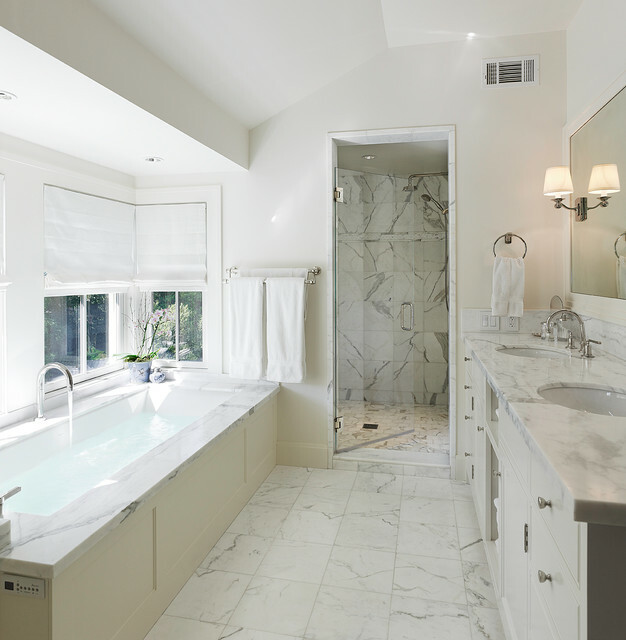 With regard to being waterproof, we recommend using our SatinSeal finish for surfaces with sinks. It is low sheen and not a thick finish yet provides great durability and is waterproof. I have butcher block countertops in my entire kitchen, we stained them with a color reflective of mahogany and then coated/sealed them with a food safe clear coat made for boats. It took some brief researching but it works great. It would be a crime to put stain on walnut. 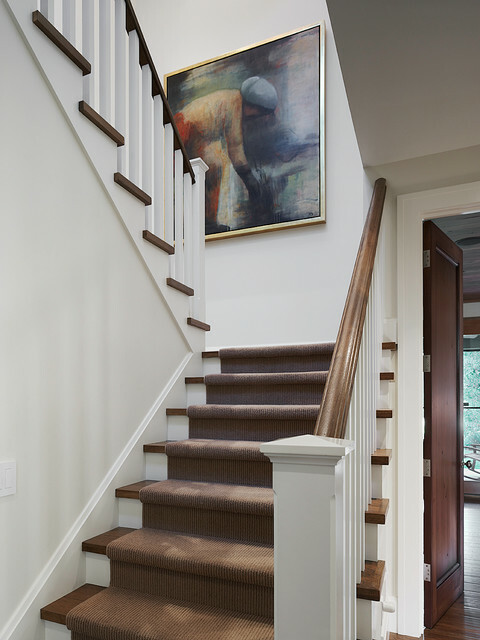 Woods always finish richer when you let their true color come through with a simple natural oil or clear SatinSeal finish. 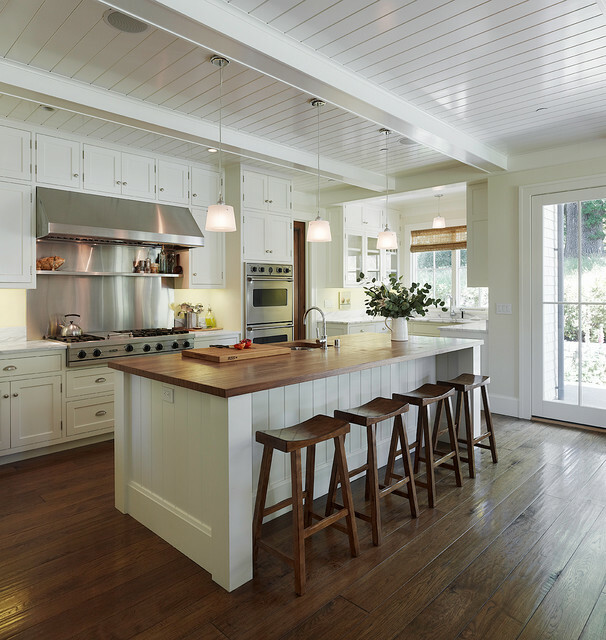 - Is the floor a hardwood or laminate, since its in the kitchen. Do you know what color stain was used for floors? I'm doing something similar... Walnut island and white oak random width floor. Having a hard time figuring out what stain to use on the floor to complement the Walnut. 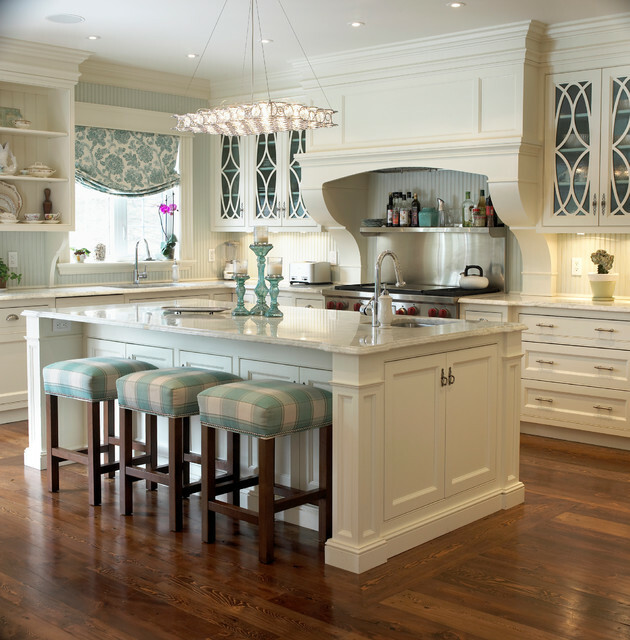 I like the way the floor and island work together here. Love the flooring! Where did you purchase it? Cabinets with the exposed hardware looks beautiful! Would you please tell me the brand/manufacturer of the pendant lights? What color stain did you use for the hardwood floors? 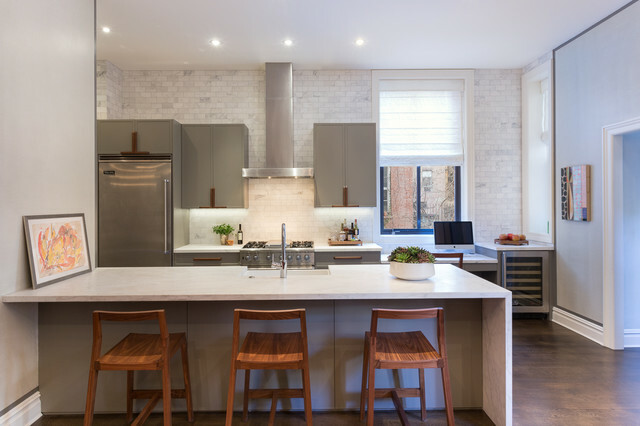 The Bar Stools in this photo are available through Mr Bar Stool In Old City Philadelphia. They are available in a variety of finishes. We don't have them featured on our website as of yet (www.mrbarstool.com) however you can order them from us by phone. Please call our sales desk @ 215-925-4800 or 1-800-STOOLS-1. 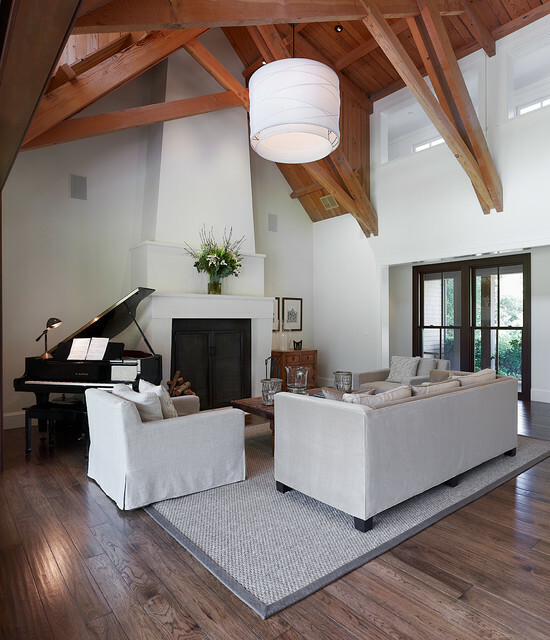 Floors - are they real hardwood planks or engineered hardwood? 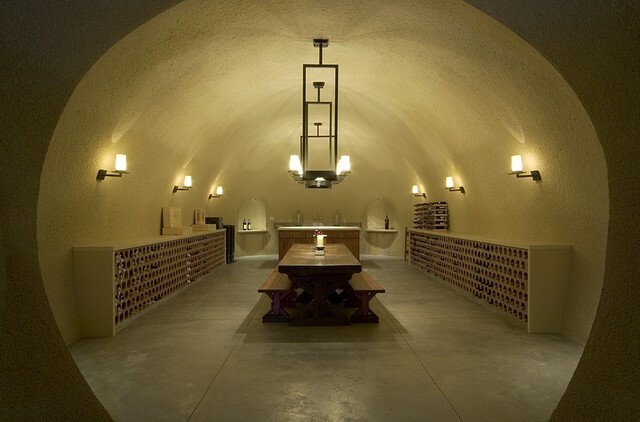 What kind of materials were used for the celing? This effect is called ship lap not sure the material but my husbands woodworking company produces this for some clients. where can I purchase bar stools like these? pottary barn has some every close to these. - Can you please share who makes the pendants? 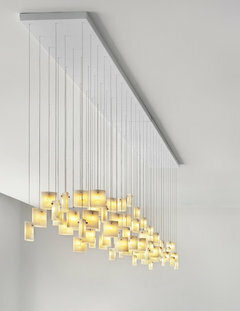 If you don't find a source, some of our fused glass lighting is very similar to this. Especially our Tulip pendants! 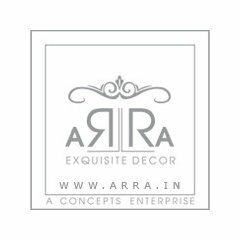 They're completely custom-made in size, color, and number of pendants, so it's perfect for your space. - Where can I purchase this lighting? Thank you. 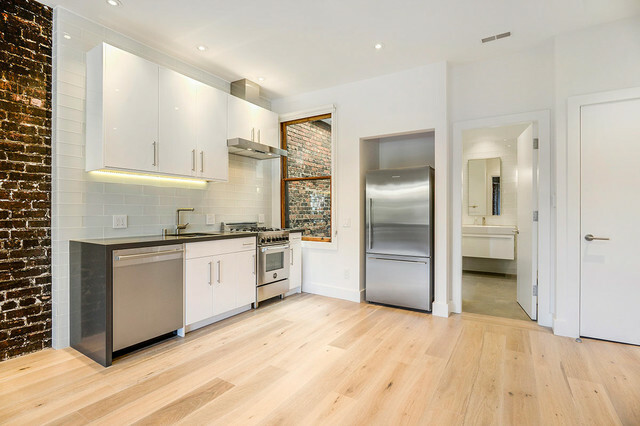 - what are the dimensions of this kitchen? Could you please tell me if these are 10ft. Ceilings? Thx! 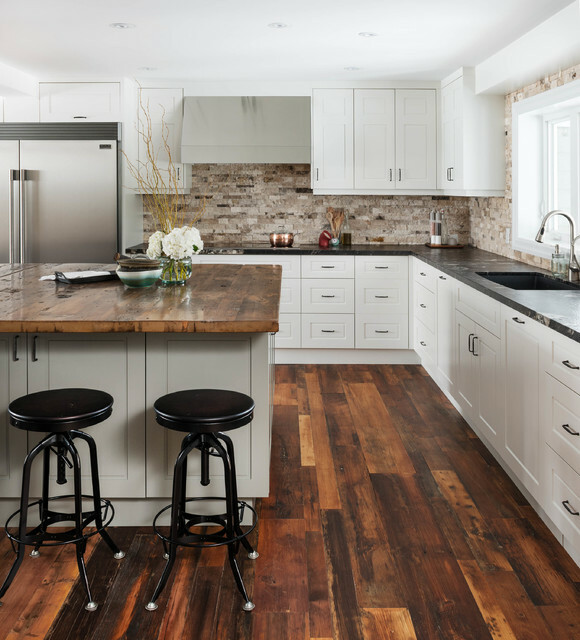 love the easy, causal look of this kitchen. - Where are the pendant lights from? Thank u! I'd love to know where to get those bar stools please? 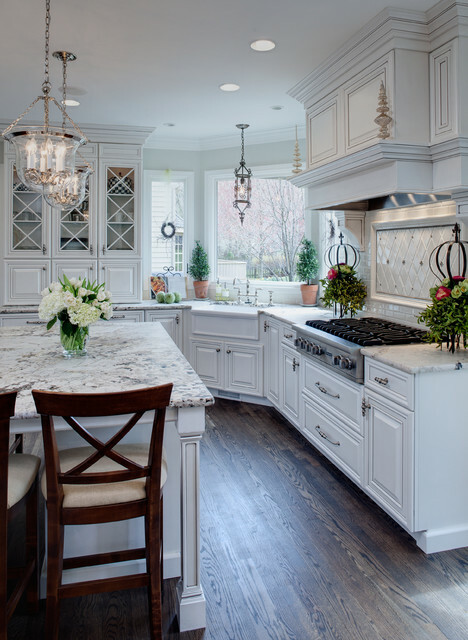 - What a gorgeous kitchen!! What is the width on that island? Thank you! 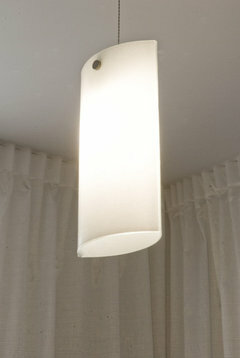 It's 9 ft by 4 ft.
who is manufacturer of lighting? 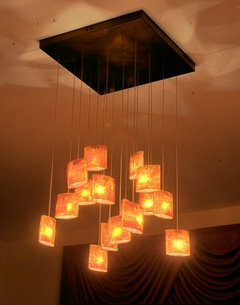 Reminds me of some of our fused glass pendants! They're fully customizable in number of pendants, size, and color. 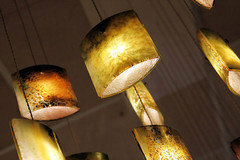 We make Contemporary Stained Glass Lighting and Art and we make similar lighting called the Shells and/or the Tulip. We customize size and color; visit our website at http://www.lightinart.com/ to see some options. Love the floors, what are they? 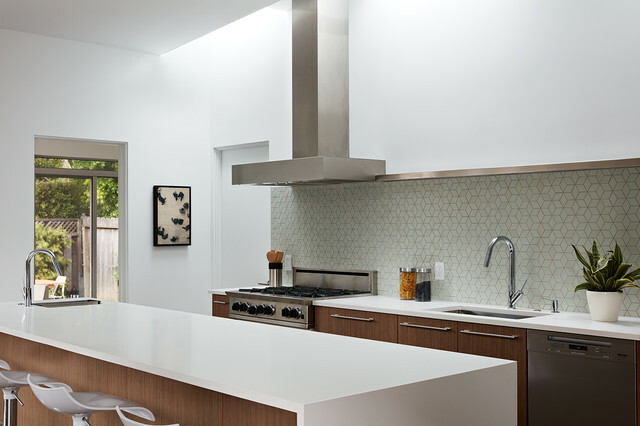 What material is the backsplash and where can I find it? Yep ! Wondering the same thing....would love to see more pics ! Where is that refrigerator hiding??? - Does anyone know cabinet color? What's the cabinet color? And is the trim and cabinet color the same? could you tell me who is the manufacturer of range top please? where are the pendant lights from? Is all the hardware polished chrome? Thank you and love your space! Waiting to hear what the wall color is. - What are the depth and width dimensions of the island? 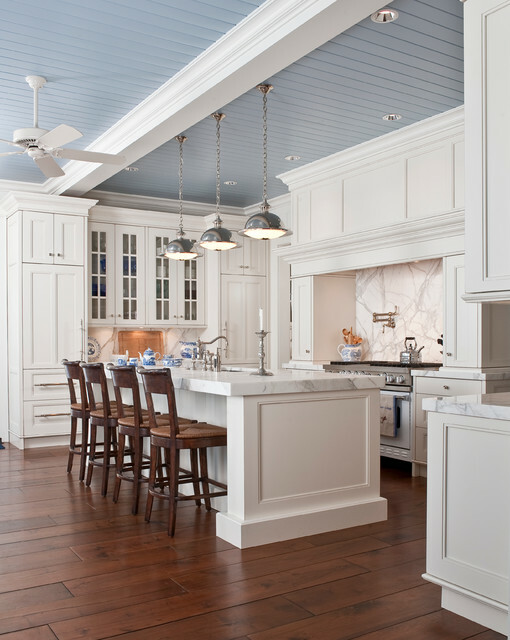 - What is the paneling material on kitchen the ceiling and island? What is the wood on the countertop. What is upkeep? why are the bedrooms so sparse? - barely any art in the rooms! - Who made the cabinets and hardware? 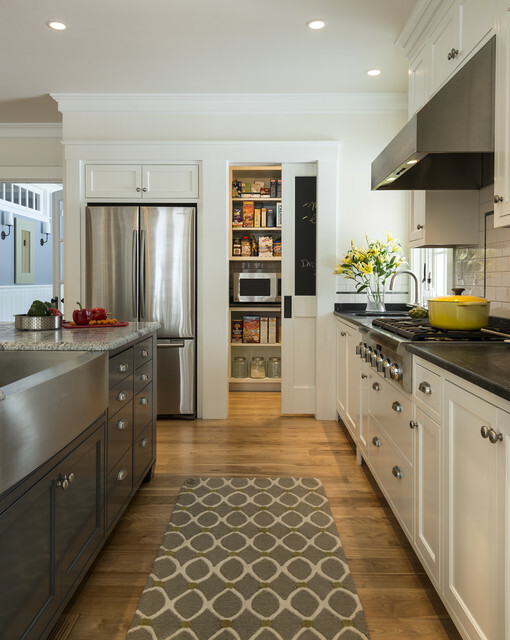 What is the spacing on the island beadboard design? do you have a front view of this island? 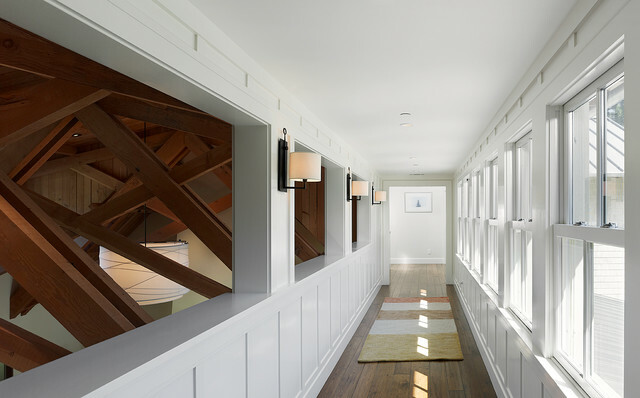 - I'm loving the ceiling paneling, and wall paneling. What is it, and how wide are the grooves in the paneling. I'm thinking of putting something like this in a cottage, and like this look. - Where are the stools from? we would like to know the cabinet paint color please? ok, this is definitely the style roofing and design that I love..
- What style of architecture is this home... beautiful. - Are the floors hardwood or laminate? it is realy or rendering in 3d programme? What kind of shades are on the widows and where are they from? - I like how light and airy it looks. 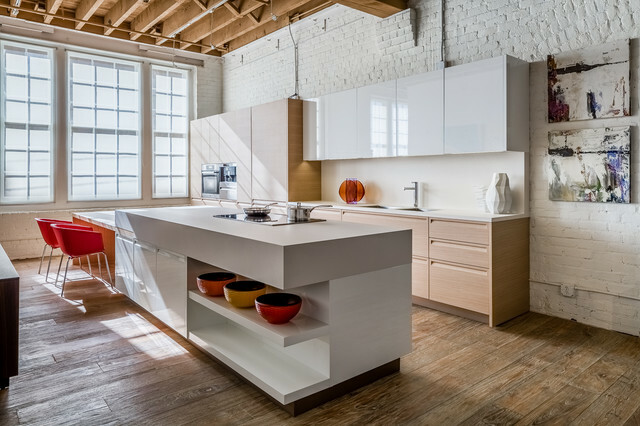 - What are the countertops made of? - Can you tell me where I can find the light above the island. - Where did you get the wood top on island? What kind is it? What are the dimensions of the island? Beautiful design. What kind of wood on the island? the stools are very nice. who is the designer? - I am painting my master bedroom a smokey blue. I have a white bed comforter, and dark bedroom furniture set. What color curtains would go well with the room? - I want to paint my wood cabinets white what color did you use? what is the size of the Kitchen ? - what is the size of the Kitchen ? can these chairs be found in Kenya? is there a dishwasher in the island too? - what kind of revealed hinges? Can you tell me what manufacturer and size the cooktop is? - Are these Carrara? Thanks! what is the ceiling made of? what is the ceiling naterial? - Do you have pictures of a built in bar?? How wide is the board under the bar? 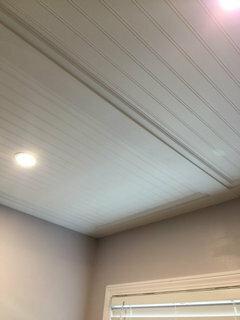 Is it bead board or tongue and groove? Who is the cabinet manufacturer? 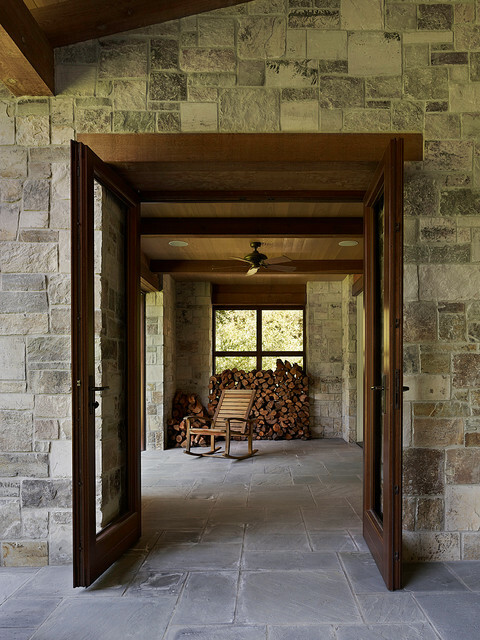 What is the name/line of the door front? What is hand scraped hardwood? - Is this hand scraped hardwood? This is a fantastic space. If a client were to want a bit more color, what would be your top recommendations? 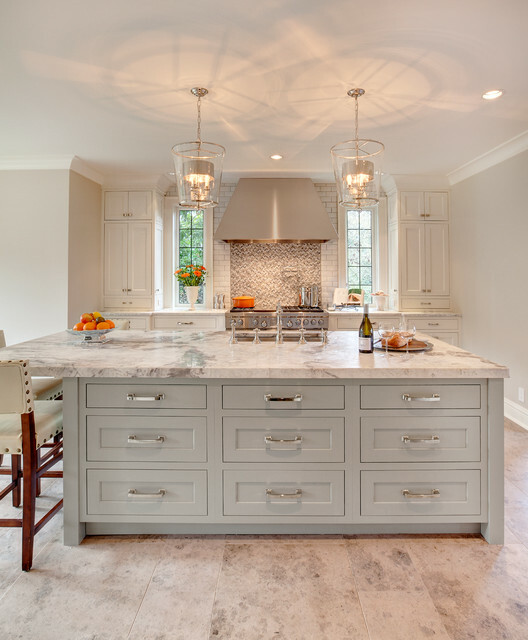 What are the dimensions of the wood island countertop? 3. Try screen sharing. I recently finished a project here, in California, where my clients were comfortably sitting at home in Massachusetts for 95 percent of our meetings. These clients are extremely detailed; all the minutiae were methodically designed. We spent countless hours in virtual meetings doing screen sharing — I remotely viewed and took control over their Mac computer — which allowed them to carefully review every aspect of their project. I love all the white mixed with the cognac colored wood. I love the brass k band the stainless steel appliances. 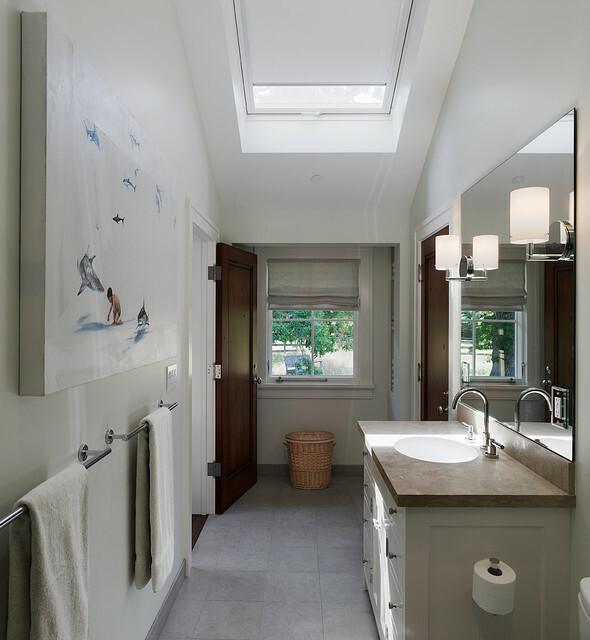 I like the seagrass window shade.